This was the Jane Russell movie most people saw after five years of ogling her pin-ups, The Outlaw a sufficiently hot potato as to be shunned by circuits and certainly small towns. Howard Hughes went for lurid even in push of this placid drama wherein war-widowed Russell must rejoin romance ranks as embodied by flyer Louis Hayward. 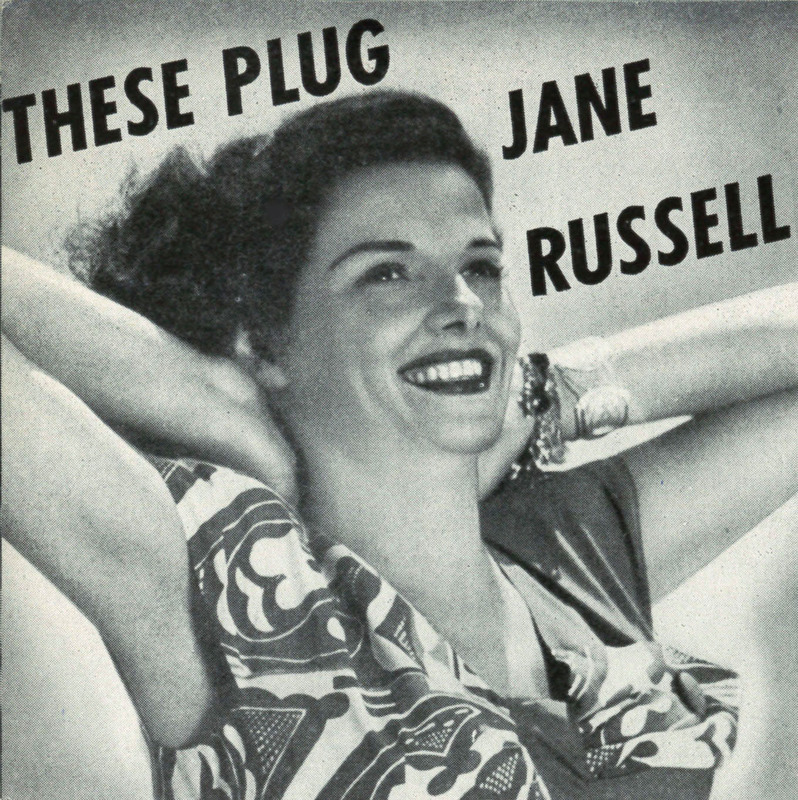 "What Are The Two Biggest Reasons For Jane Russell's Success?" asked Hughes' publicity, to which everyone giggled the answer, and why not? To pose such a question was asking for trouble. A wider public hadn't seen Russell other than in still photography on haystacks or carrying milk jugs. Hughes was insanely unsubtle, or was he merely insane? For all his micromanage of publicity, HH interfered less with production of Young Widow, Jane Russell having been loaned to independent producer Hunt Stromberg. Part of that deal included starter Faith Domergue in third-bill placement, even though she'd have but two scenes. Hughes would also negotiate for United Artists distribution, a package deal with The Outlaw, which would go out just behind Young Widow, Russell personal-appearing with both. Stromberg took time, and lost time, completing his project. There were complications renting studio space, the producer not having access to facility of the majors. 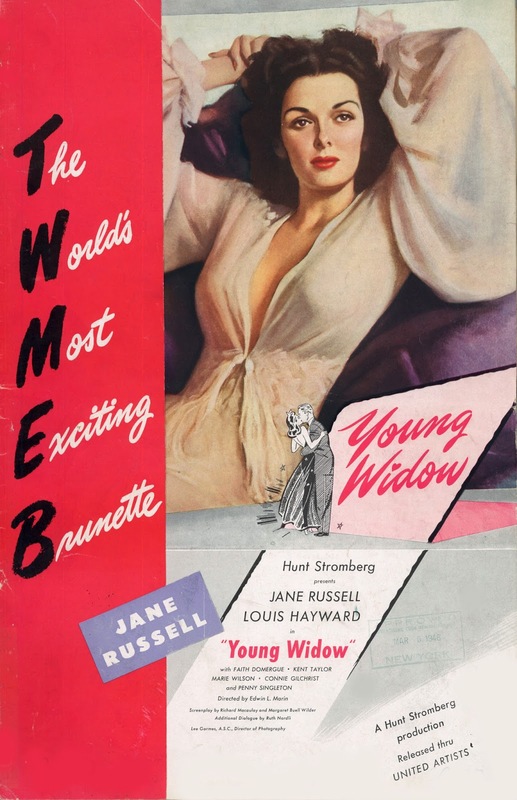 Delay in getting Young Widow started ("scripting and casting trouble," said Variety) put Stromberg beyond his lease period with California Studios, so he had to move to General Service facility. Ida Lupino had been set to star, but "pulled out because she didn't like the script," according to Variety. 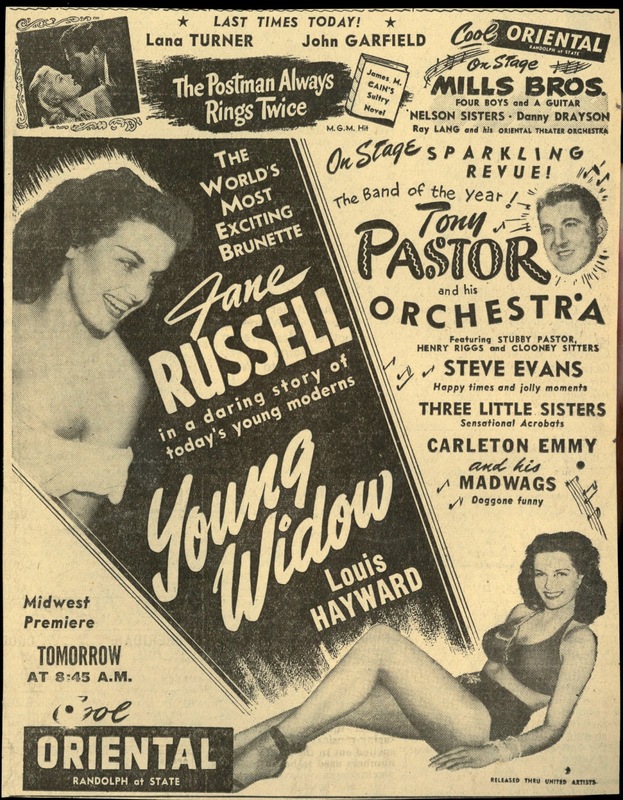 By the time Jane Russell was aboard, Young Widow was headed over-budget, to eventual sum of $600K, according to Tino Balio's United Artists book. What muddied water further was three directors in and out over shooting: William Dieterle (left after arguments with Stromberg), Andre De Toth, and Edwin L. Marin, who Russell would recall as too literal with regards script and gave no leeway for actor input. Maybe a most important element was stills, specifically ones of Russell in negligee and provocative pose. Two weeks were spent on these. If Young Widow sold, photo art was how they'd sell it. 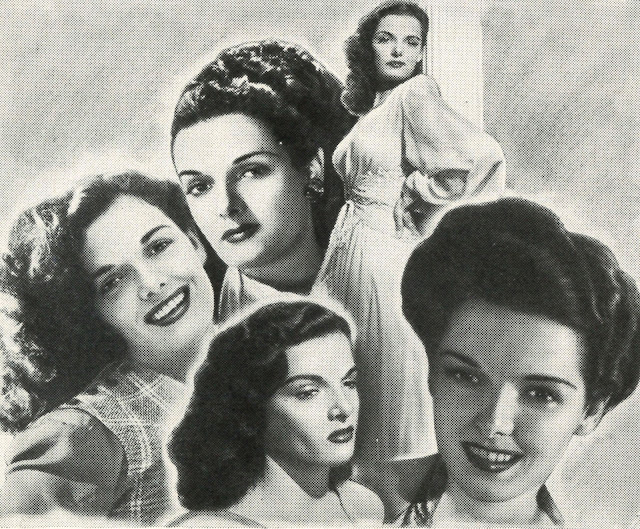 JR was tendered as "The World's Most Exciting Brunette," much of ads with her in bathing attire and/or sleepwear. Who'd have known going in how somber this drama would play, especially for a first act with Russell wallowed in grief? Well, the title warned them. It's only when action switches from bayou setting to Gotham night life that action picks up. Maybe audiences got tired from waiting on The Outlaw and Russell to show up on screens, accustomed to her as a face on mag covers and not movies, for Young Widow crash-fell to $1.2 million in domestic rentals, and only $355K foreign. Those numbers should have been better in attendance-peak 1946, and certainly more was needed to cover overruns incurred on the film. 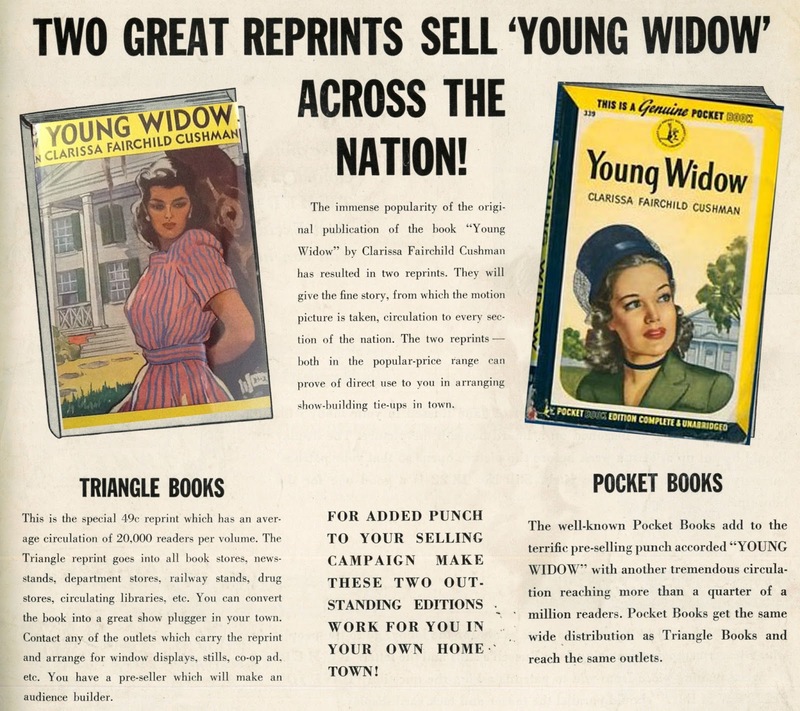 Young Widow has gone into hibernation since, other than a 50's reissue titled The Naughty Widow, and early syndication. What shows up infrequently on TCM looks to be 16mm, so no idea as to where present-day ownership lies. LOVE the typo in the Oriental ad -- it looks as though the Clooney Sisters never left their chairs on the bandstand! Recalling how in later years Russell did brassiere commercials, cheerfully identifying herself with America's "full-figured gals" without any smirking. Russell and breasts had both become respectable. One wag referred to the ballyhoo surrounding Jane Russell by spoonerizing the title "A Tale of Two Cities."